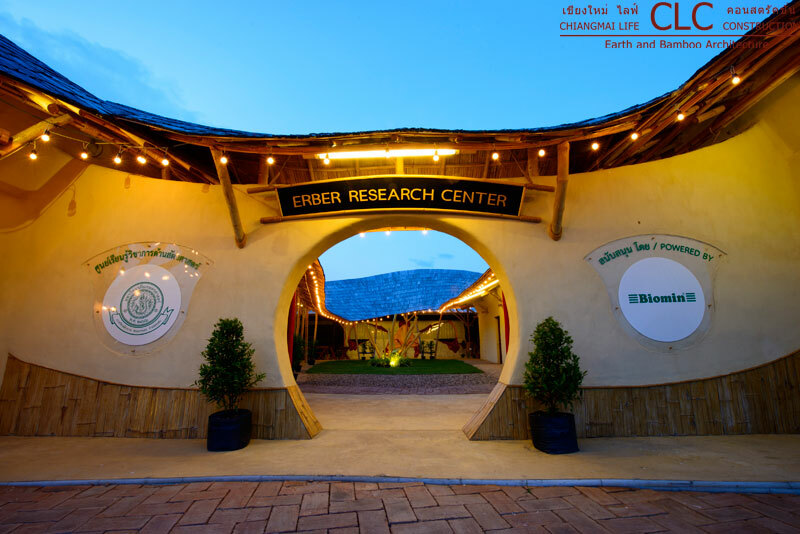 The Erber Research Center at Kasetsart University, Thailand’s huge University for Agriculture covering over 5,000 acres of land, is part of a cooperation with Biomin of the Erber Group focusing on chicken farming. 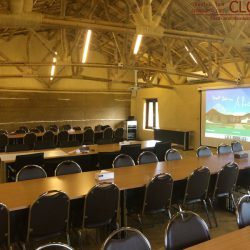 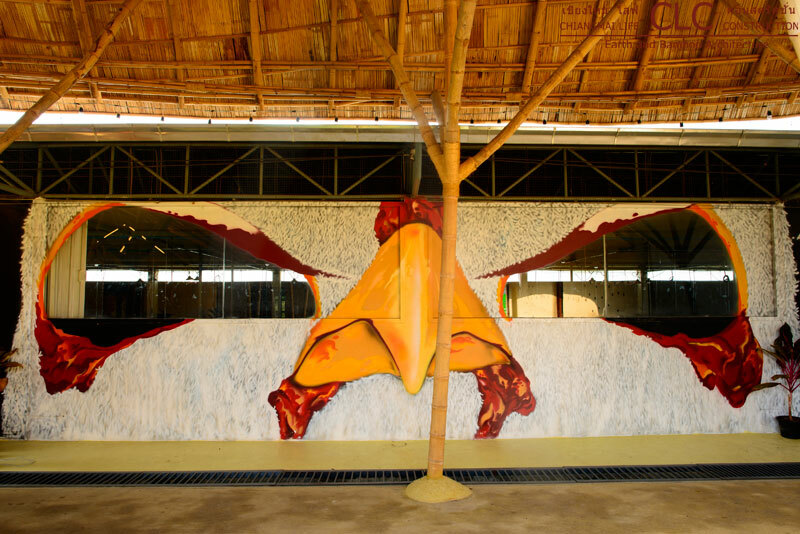 A previously built broiler hall needed an adjacent facility for teaching and further research. 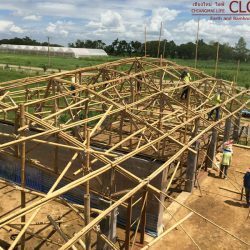 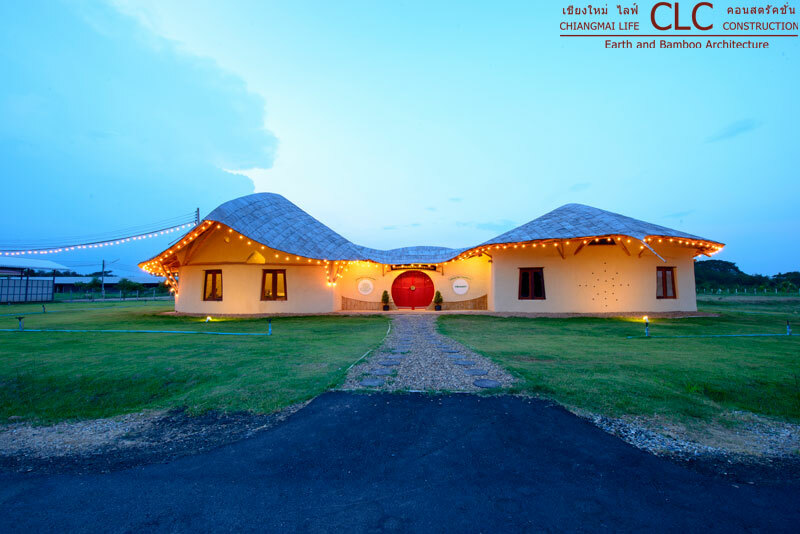 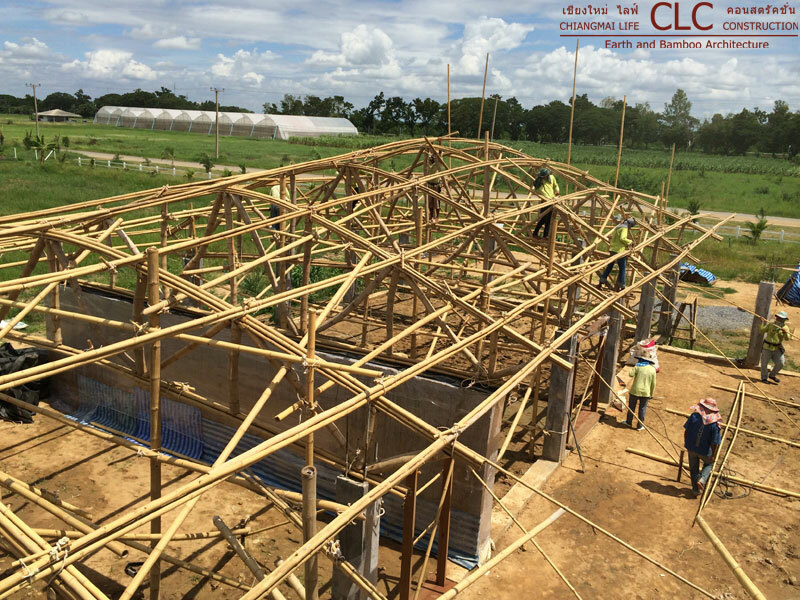 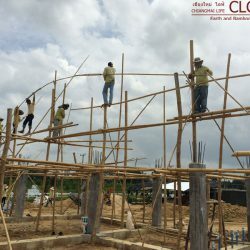 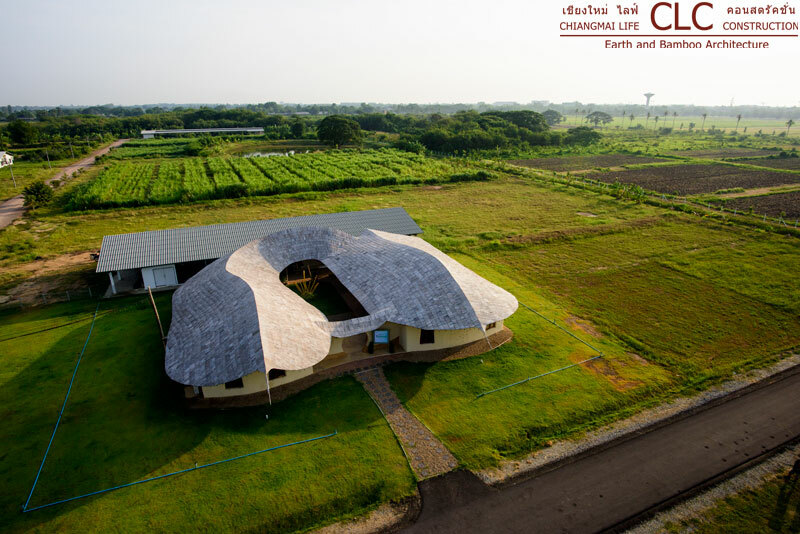 Chiangmai Life Construction’s concept of this 563 sqm facility is based on the lay-out of the traditional farm house with a square courtyard. 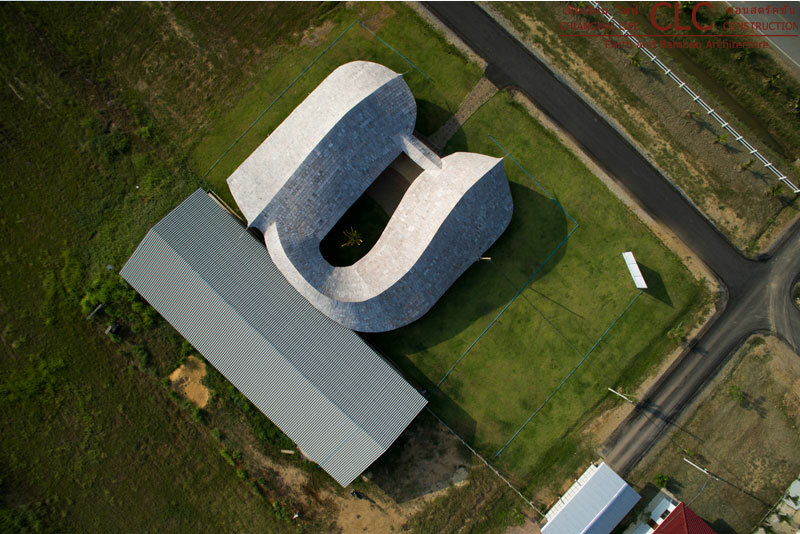 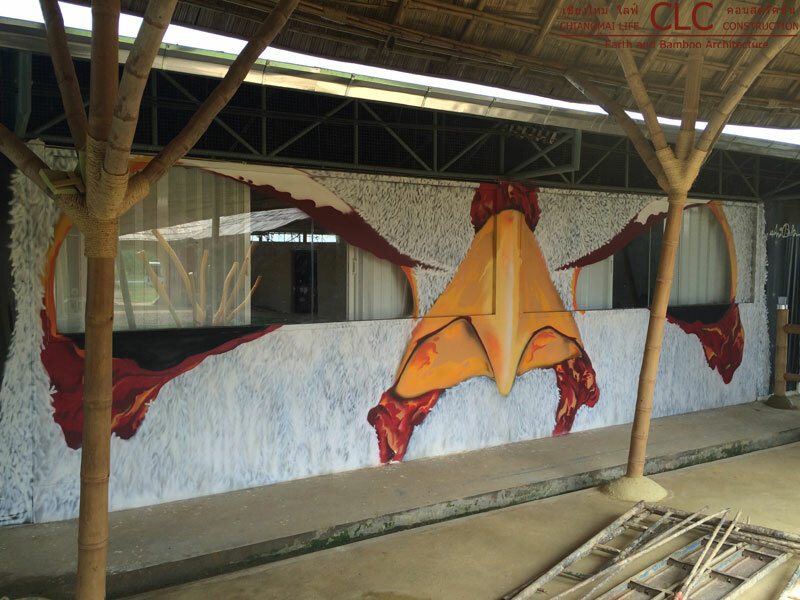 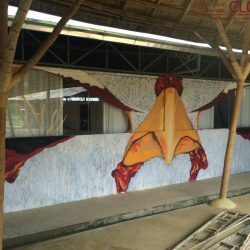 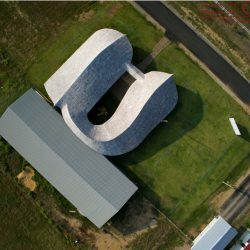 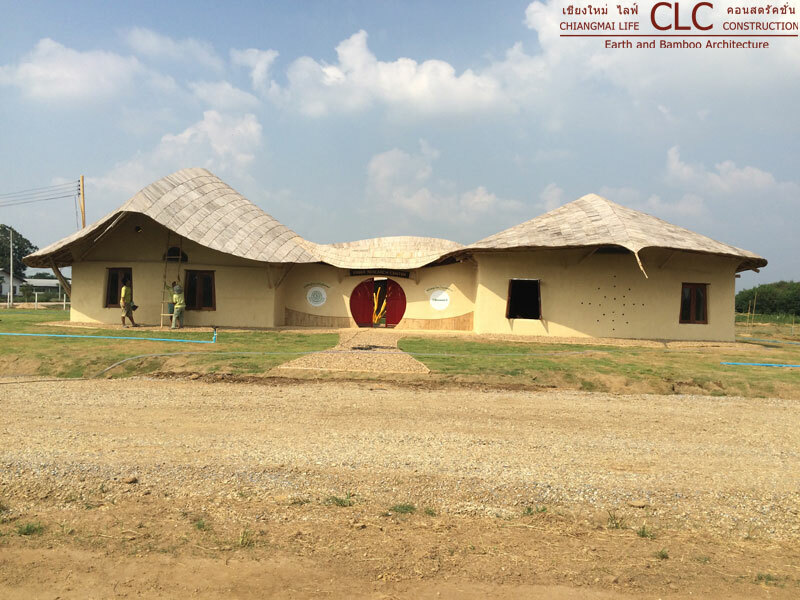 A covered observation platform allows students and visitors to observe the broiler house activities through windows which were transformed by a famous Thai spray artist into the eyes of a chicken. 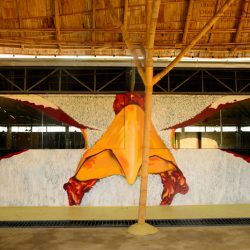 This platform connects on one side in a right angel to a meeting room and a lecture hall and on the other corner to an office for the researchers as well as the necessary infrastructure – kitchen and bathrooms. 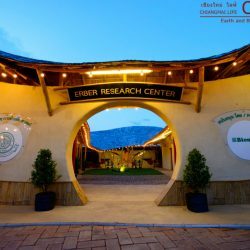 These two legs of the institute are connected in the front by a traditional earth “moon gate”. 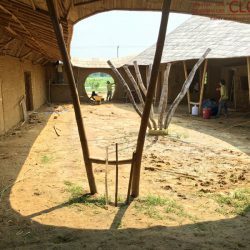 This layout of a central open-air space encircled by a shady arcade with lounge like informal spaces which again is surrounded by rooms filled with activity not only refers back to the roots of agricultural life but also immediately creates an intimate space conducive for exchanging ideas and concentrated learning in an otherwise vast open expanse of fields. 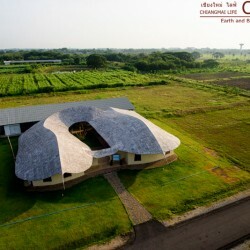 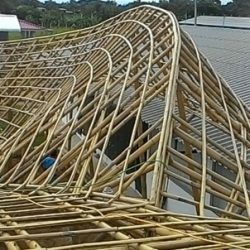 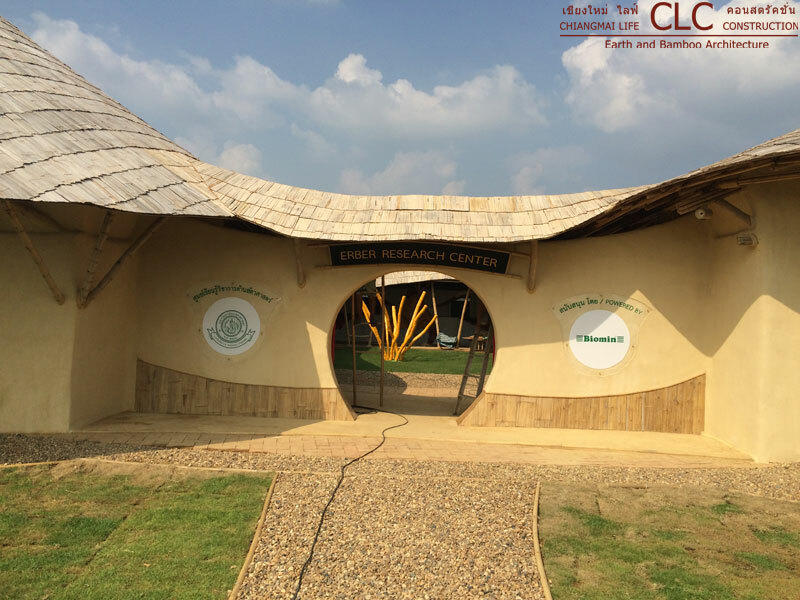 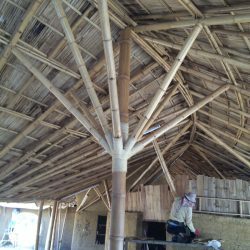 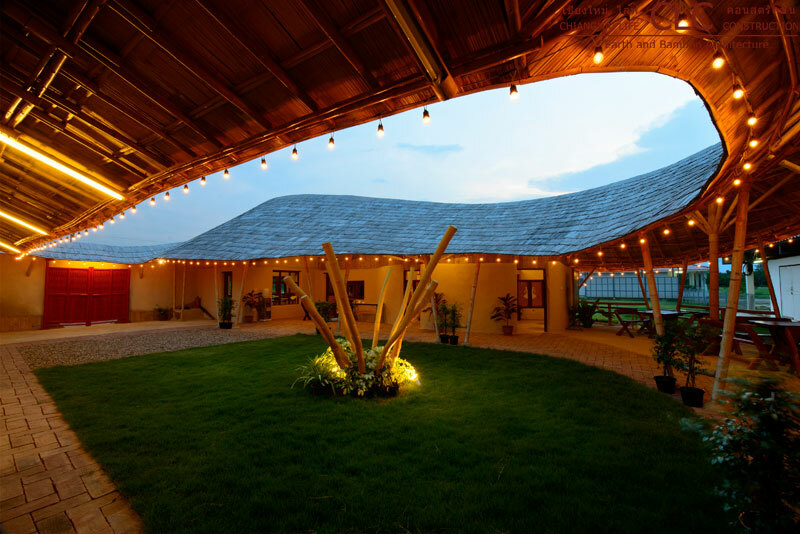 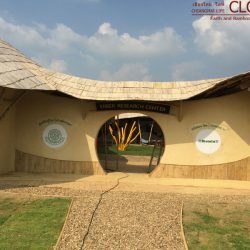 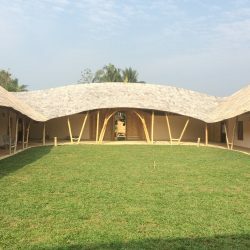 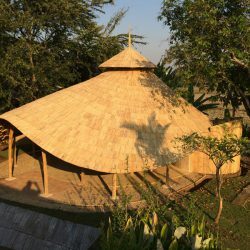 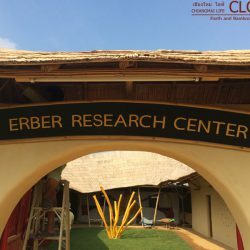 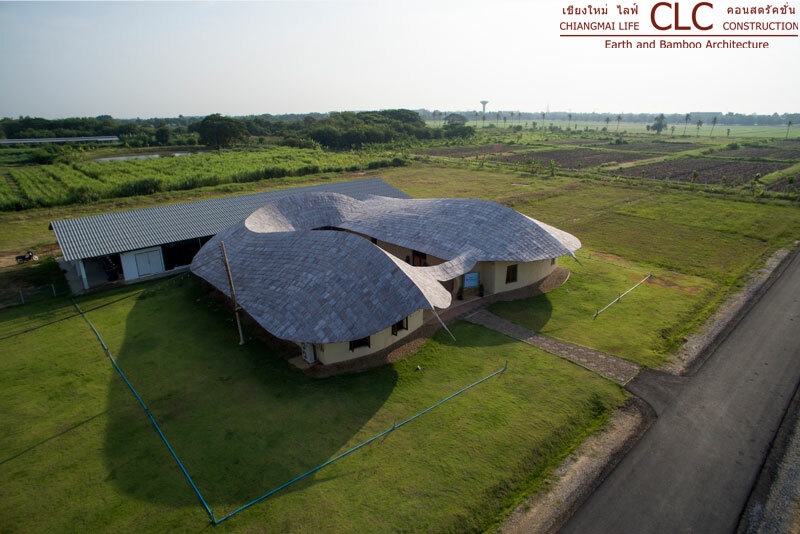 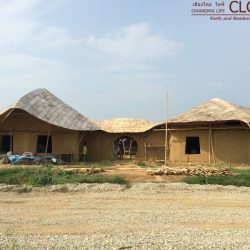 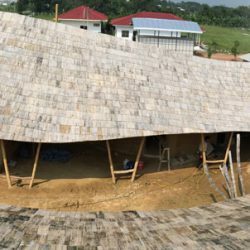 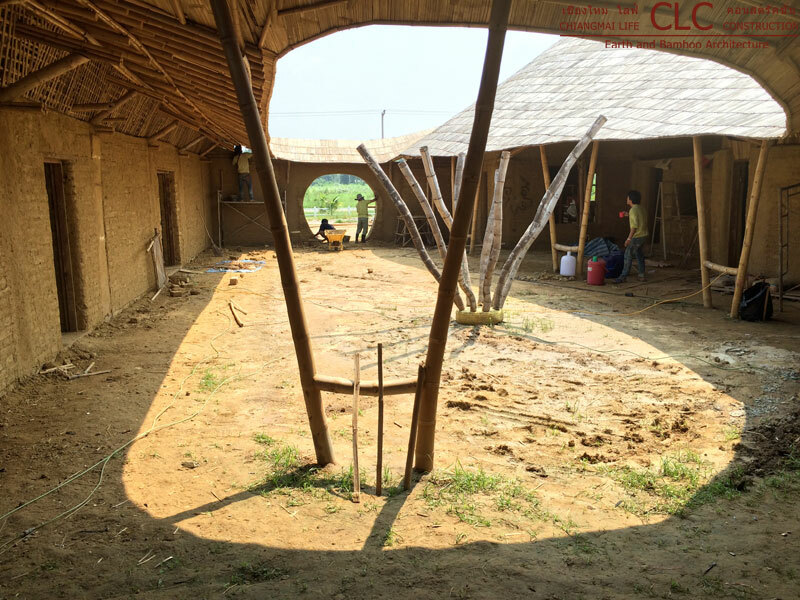 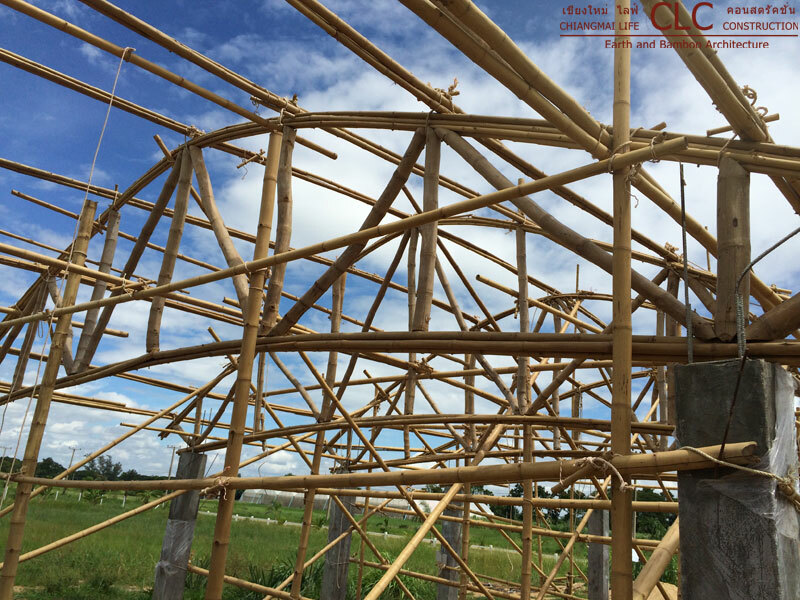 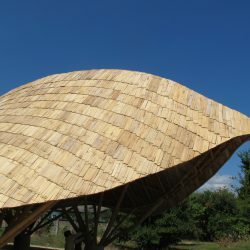 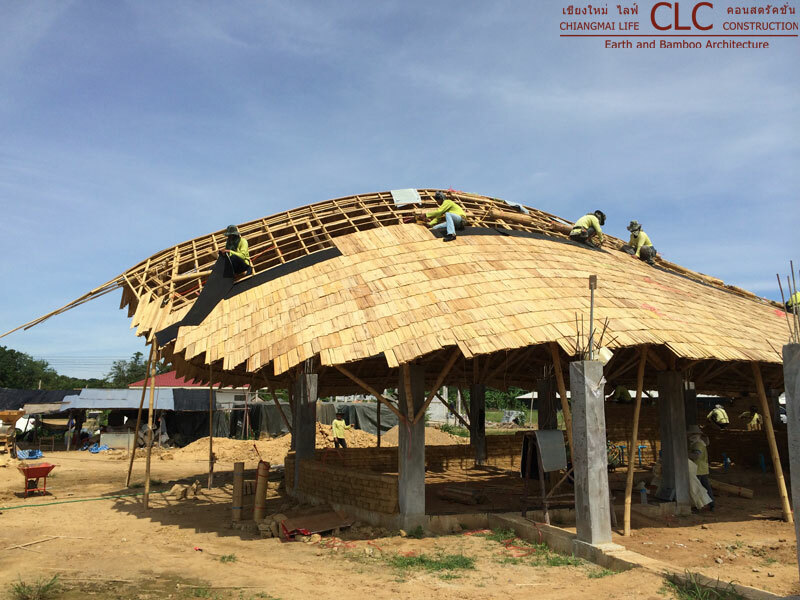 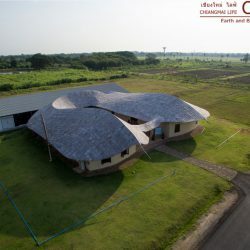 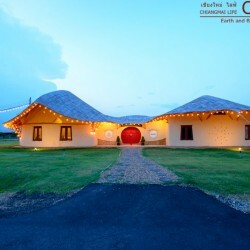 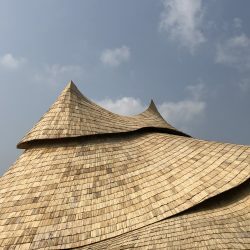 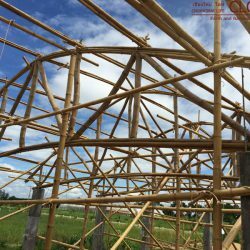 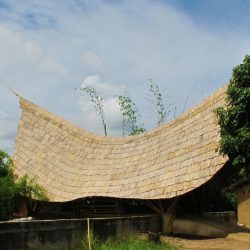 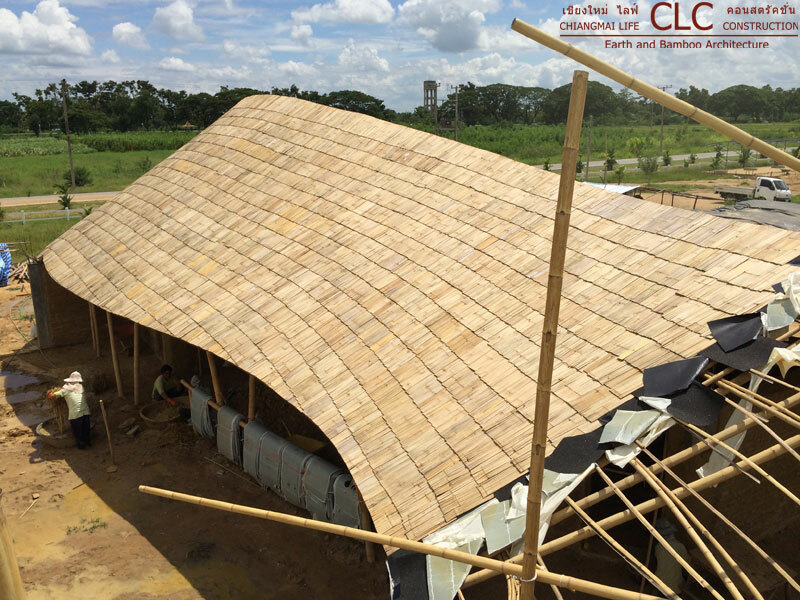 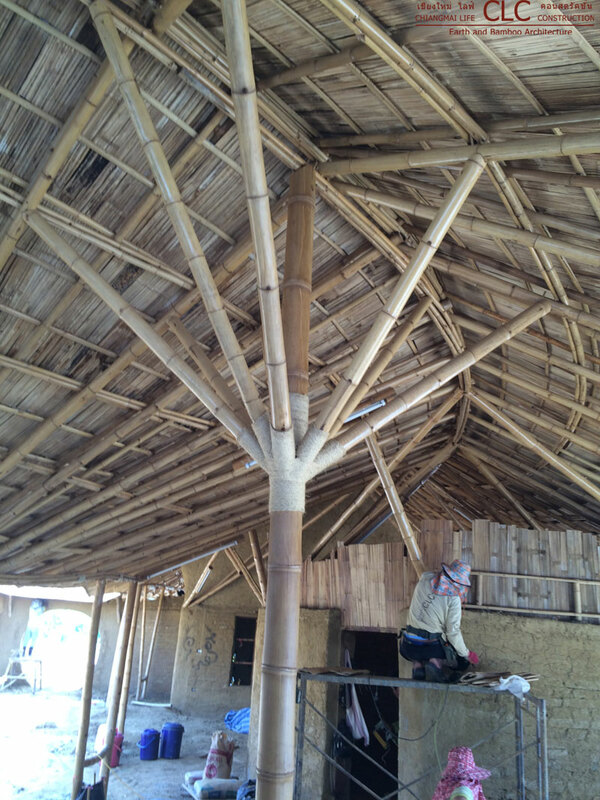 This connection of the Erber Research Center to agriculture is enhanced by the materials used – mainly earth and bamboo. 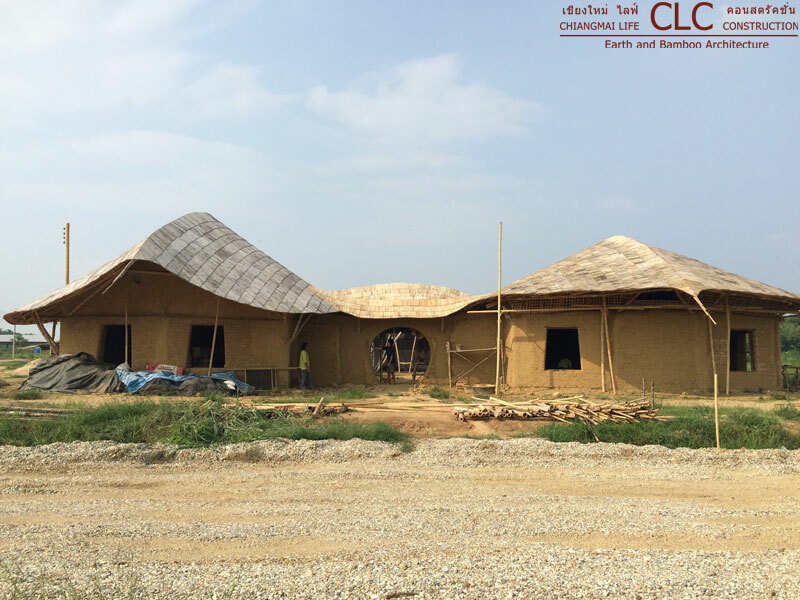 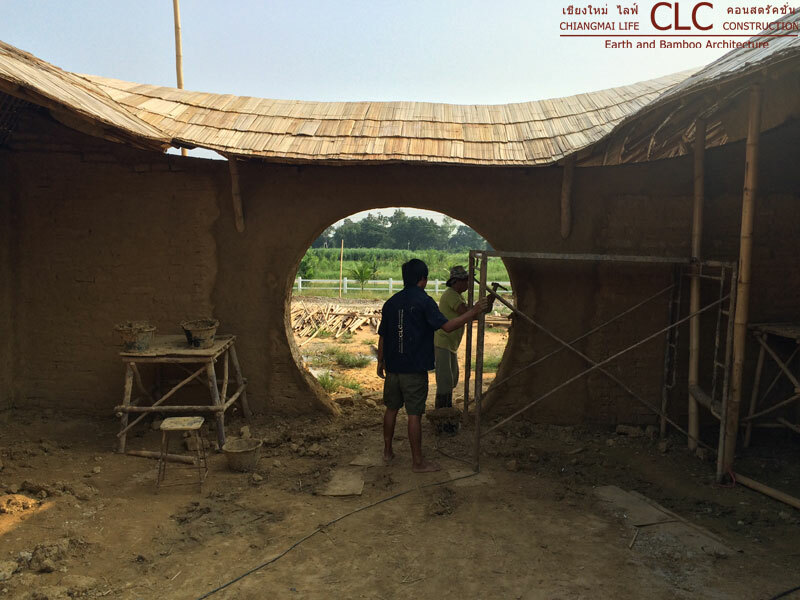 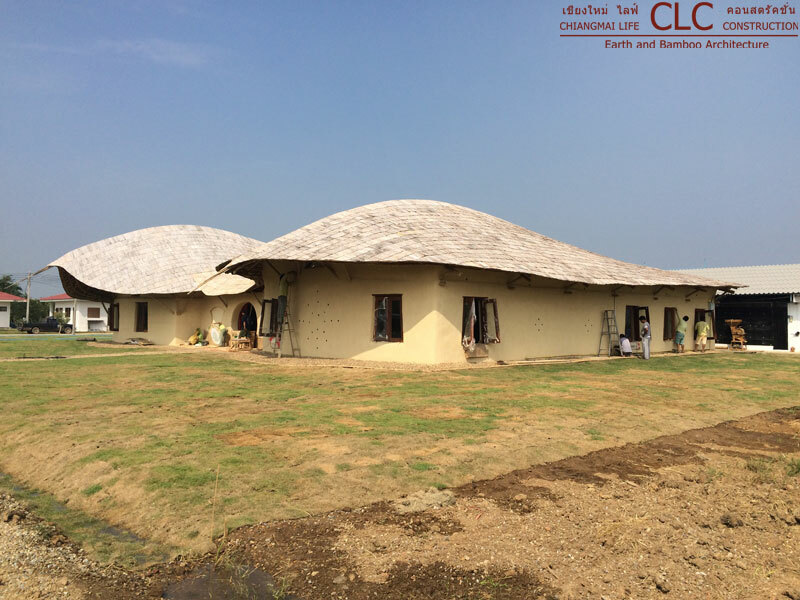 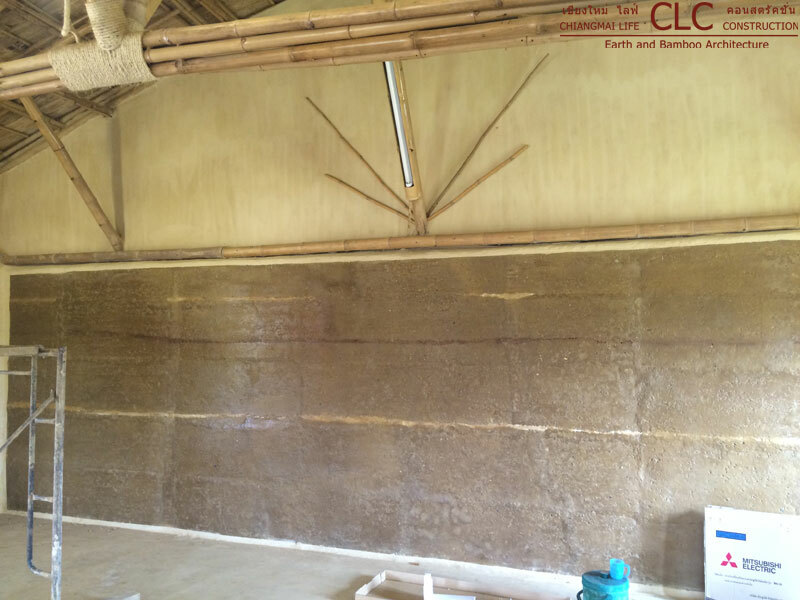 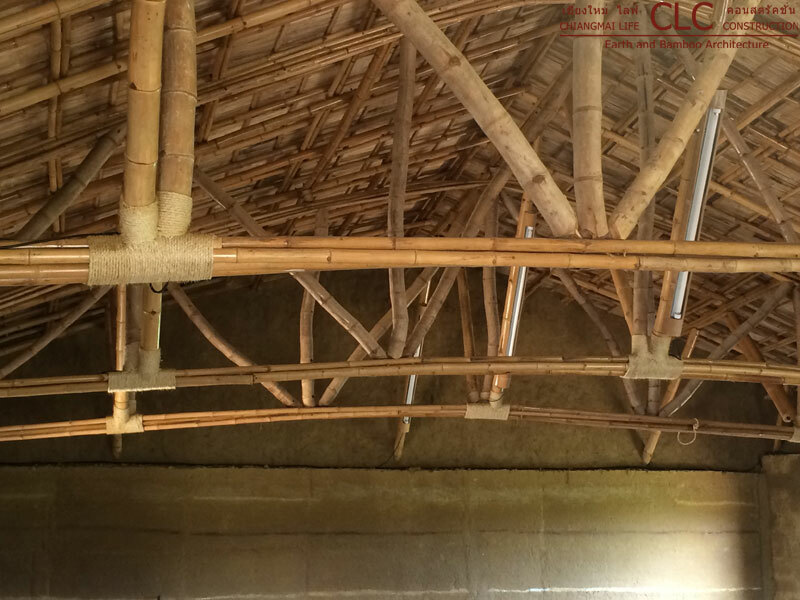 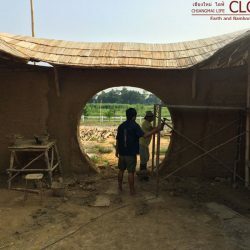 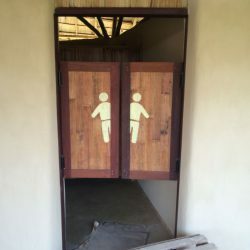 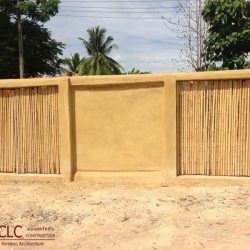 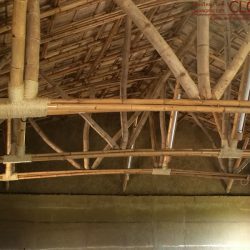 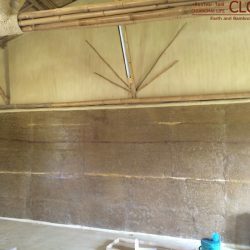 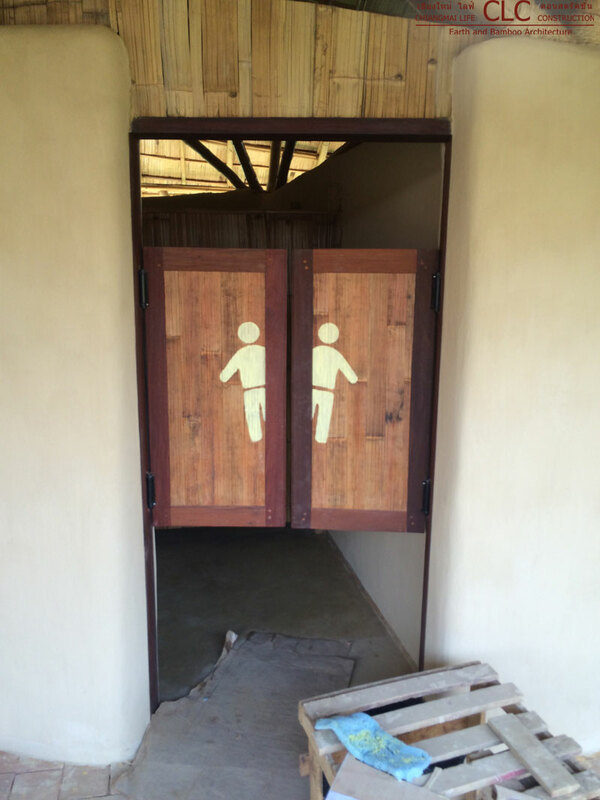 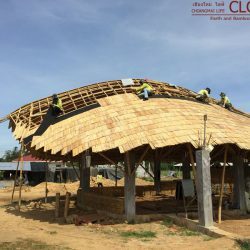 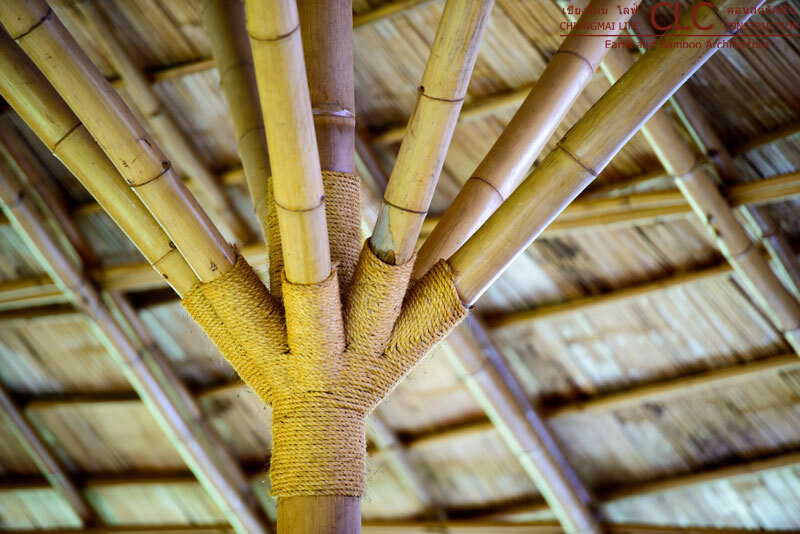 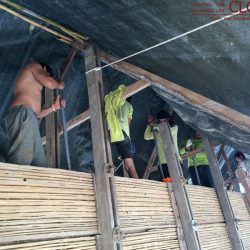 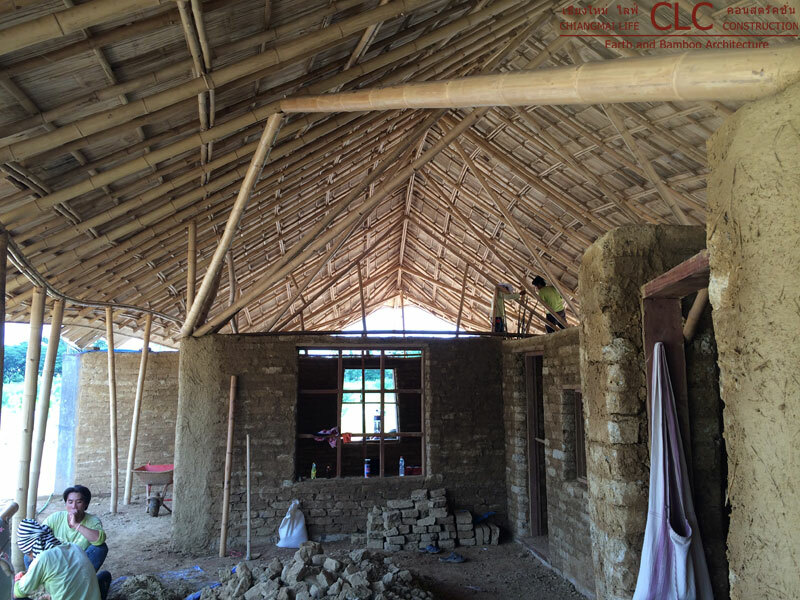 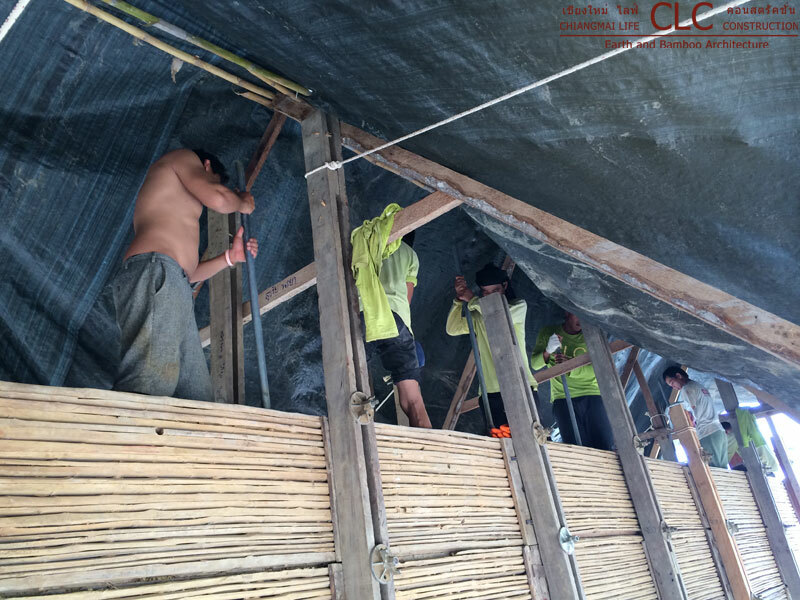 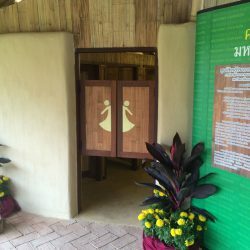 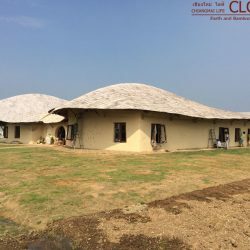 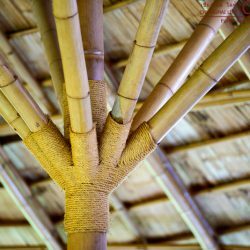 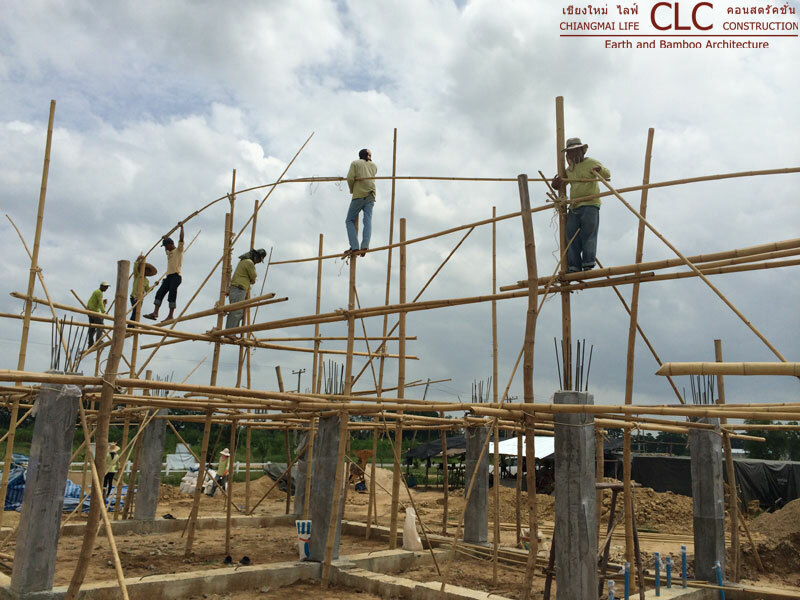 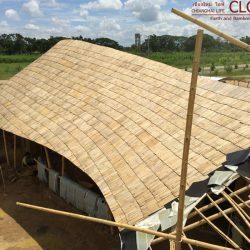 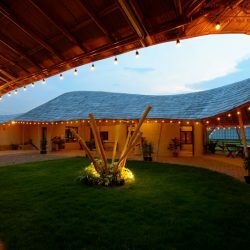 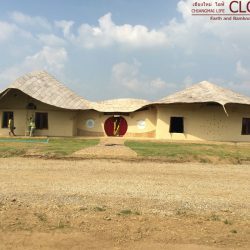 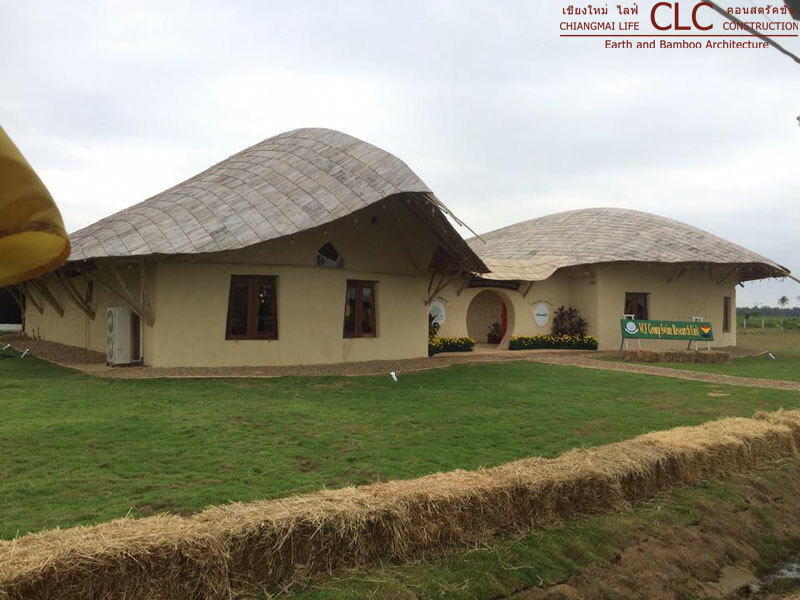 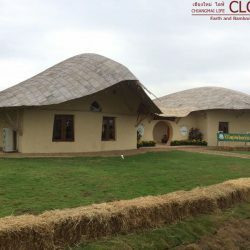 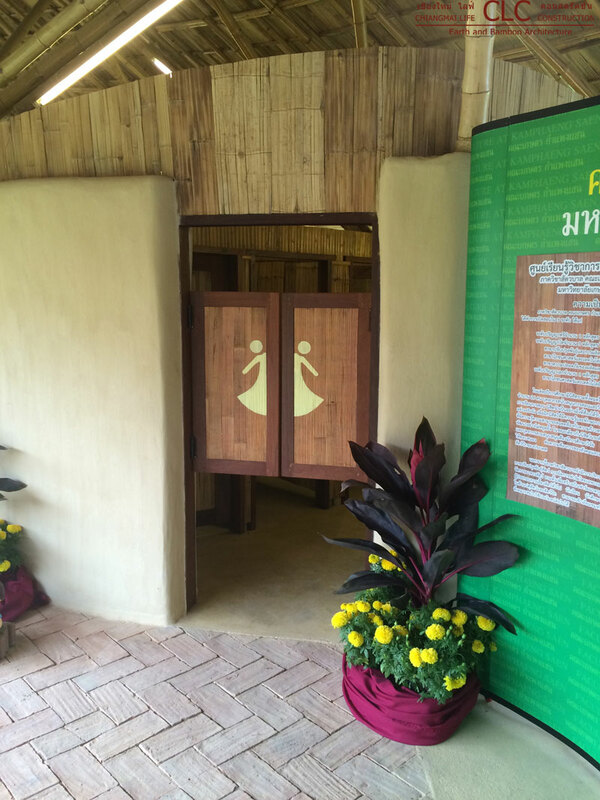 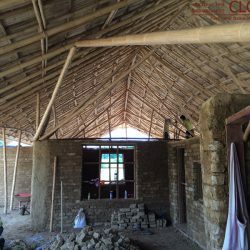 The earth walls are made of adobe bricks which were produced on site or rammed earth and the roof is made of salt-treated bamboo. 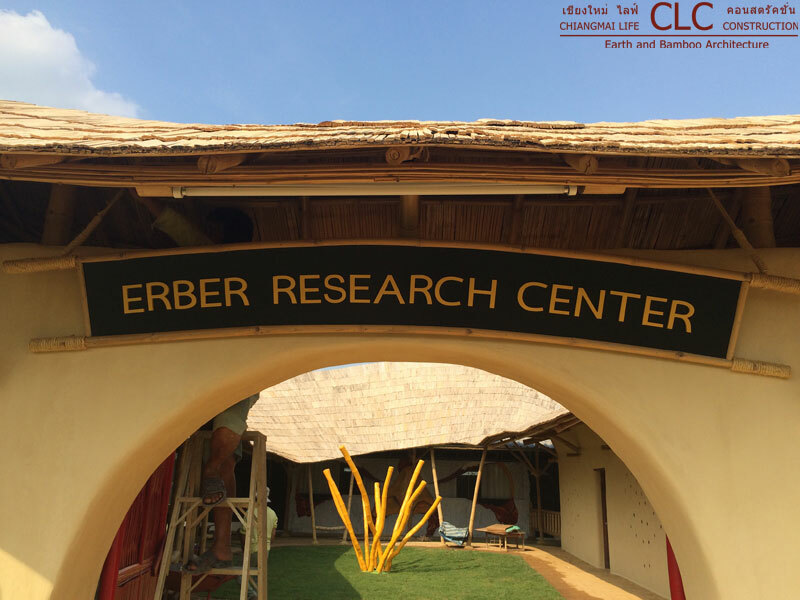 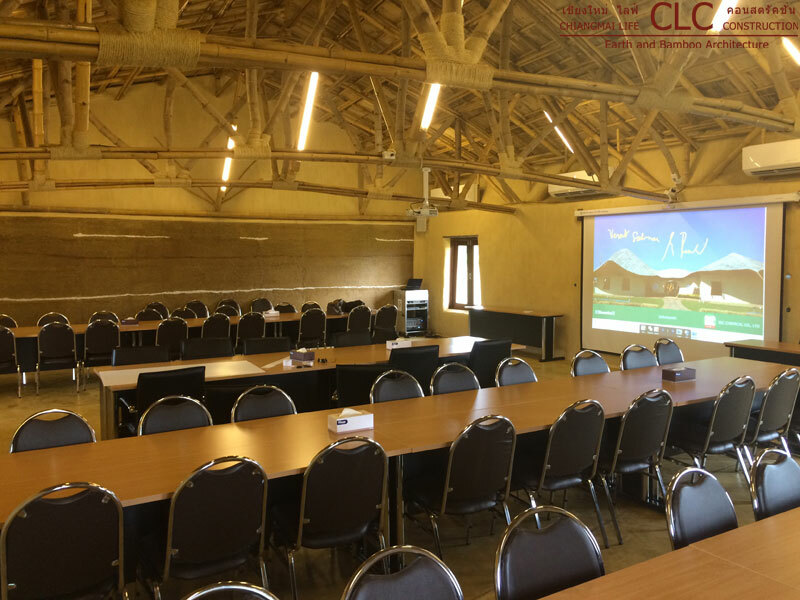 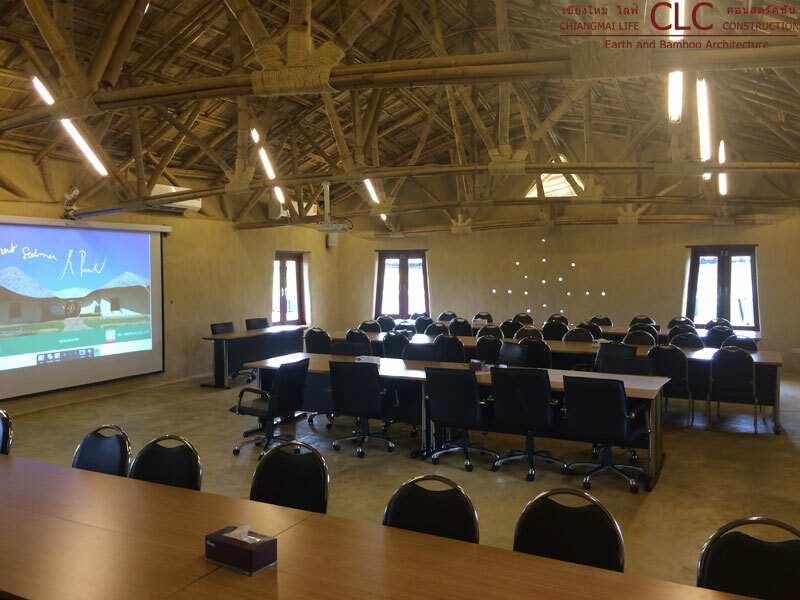 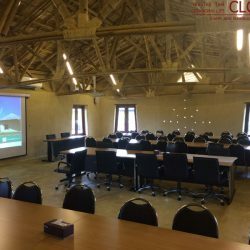 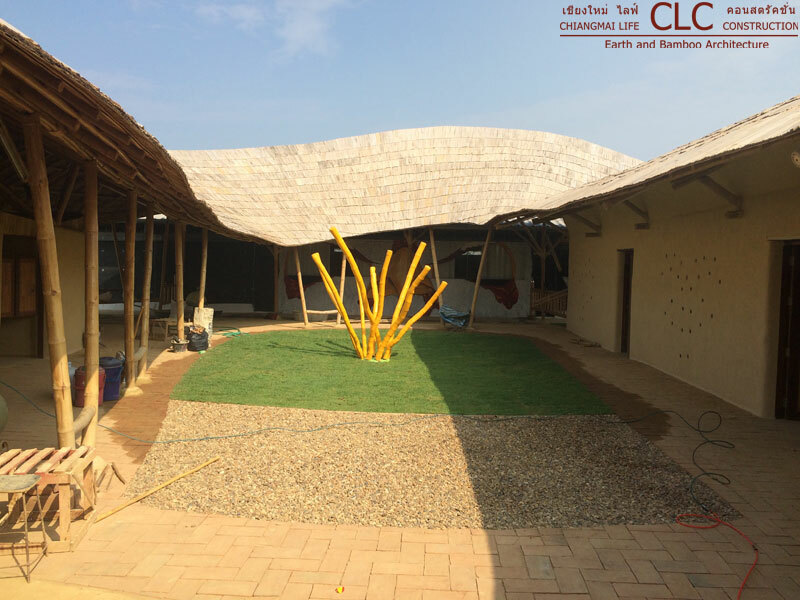 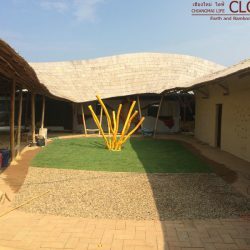 Not only do these materials create very comfortable and cool spaces, the carbon footprint having been reduced by over 90% is in line with the purpose of the Erber Research Center and Lecture Hall inspiring how to enhance agricultural outputs without damaging the natural environment.